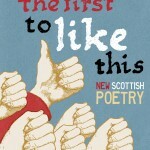 A new anthology of Scottish Poetry, edited by Colin Waters of the Scottish Poetry Library, will be published by Vagabond Voices on the 22nd September. I’m lucky to be included alongside emerging and established poets such as: J L Williams, Michael Pedersen, MacGilivray, Richie McCaffery and Niall Campbell amongst many others. There’s a launch at the Scottish Poetry Library in Edinburgh on 25/09/14 at 6.30pm and another at the CCA in Glasgow on 29/10/14 at 7pm; all welcome. For more details of all the poets included visit the website here.